Electric Boat Company named hull #341 CHIVO. and so we accepted that we were on the "Goat Boat." Now the truth is revealed! You served on a Pseudopenaeus Grandisquamis. Recently, I put this question to the crew, and I got bunches of responses. Some great, and some, well I think that too many years of diesel fumes left their mark. So, without further delay, here is everything you always wanted to know about our boat's name. I was a Radioman on board in 56-58. It seems that I can remember reading something about the Chivo and a Latin name that was mentioned. It seems that it was much like this-- Upeneus Grandisquamis. I am sure that this spelling is not totally correct but I believe that I am close. Phonetically it would sound something like this -- You-pen-knee-us ----- Gran-di-squaw-miss. I hope that this will give you some direction. I hope I am not leading you astray. Let me know if I get close. Thanks. ...................Jim Swift. 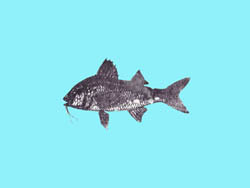 The "Chivo" (Spanish for goat) is a small fish found in shallow tropical waters off the Central American coast. 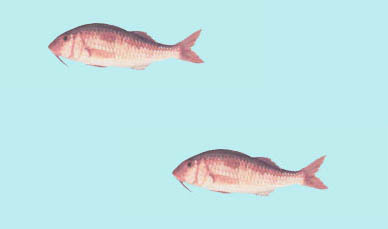 It is a red mullet, or surmullett from the Mullidés family. 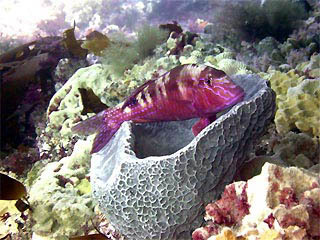 The biological name is: Mullus surmuletus -- (brightly colored tropical fishes with chin barbels). Spanish speaking fishermen named it Chivo because the chin barbells (beard) on the fish's chin reminded them of the goats within the village. Two pictures are attached. One is an actual picture taken in the Pacific Ocean off the Central American coast and the other is a sketch made by a French researcher.......Jack Bertram (60-62). Geographical distribution: Its distribution goes from 32° 43' N to 37° 00' S in the Eastern Pacific Ocean. Habitat and biology: It is found in waters of the cotinental platform, from 12 m to 68 m of depth, habitat bentonic (sand and mud bottoms). Length: Its mean length is 25 cm (TL), though they can have specimens of 30 cm (TL). Principal ports of landing: Manta, San Mateo, Santa Rosa, Anconcito, Engabao, General Villamil Playas y Puerto Bolívar. Fishing season: Possibly all year round, with greater frequency during the second semester. Importance: In Europe, the Rock mullet (Mullus surmuletus) is very appreciated, mainly in France and Spain. In Ecuador, there are these species of Bigscale goatfish belonging to the same family Mullidae, being: (Pseudupeneus grandisquamis), (Upeneus xanthogrammus), and (Mulloides dentatus). They are marketed fresh, the flesh is white and soft. Currently constitutes part of the group of species that are being exported in small quantities. Bill Woodby (55-57) went to the University of Miami's Rosenstiel School of Marine & Atmospheric Science Library for the answer. Question:Aboard the U.S. submarine CHIVO we wonder if you might be able to furnish us some information on the original Chivo, Upeneus grandisquamis which is our ship’s namesake? The Chivo, Upeneus grandisquamis, was first named by Theodore Gill from a specimen obtained off the coast of Central America. It belongs to the family Mullidae and to the genus Upeneus, which contains all of the small fishes commonly known as the "Goatfishes". They are small, bottom feeding fishes rather widely distributed in tropical American waters. Although the Chivo itself is a Pacific species, several closely related species are found in the West Indies. &bsp; The Red Goatfish or Salmonette is caught for food from Key West to the southern border of Brazil; the Yellow Goatfish, Upeneus martinicus, is also valued as a good food fish in the Key West area. The specific name grandisquamis means "large scaled". This applies to the boat and crew that I served on and with and I have no doubt that it applies to all subsequent crews as well. About the name of the ship: CHIVO, like all U.S. Submarines, is named for a fish. The CHIVO is a rather large-scaled, heavy-set fish, belong to the family Mullidae, or Surmullets, fishes of tropical seas, many of which are valued for food. All members of this group have a pair of long barbels or "whiskers" under the chin, giving rise to the common name, "Goatfishes". Known Scientifically as Upeneus Grandisquamis, the fish in coloration is greenish-brown above, rose below midsides with a pearly spot on the center of each scale, and a larger black blotch on the upper sides below the first dorsal fin. The CHIVO ranges along the Pacific Coast of Mexico and Central America from Guaymas to Panama. It reaches a length of eight or nine inches. Goatfishes are characterized by two well-separated dorsal fins and by a pair of long, sensory chin barbels. 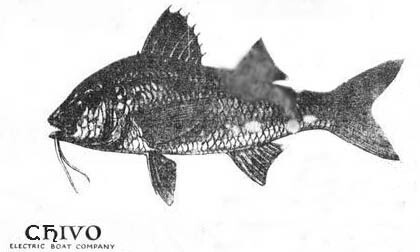 The barbels are used to find the small, bottom-living invertebrates onwhich the fishes feed; when not in use, the barbels are flattened into a groove on the throat. Inhabitants of shallow water, goatfishes are found in warm and tropical regions, along reefs or over mud or sand. They are often brightly coloured, in shades of red and yellow; some are able to change their colours. Submarines are named for fish or "Denizens of the Deep." At the peak of the shipbuilding program, the navy had around 500 submarines afloat, a-building, or a-planning, and that's a lot of fish. I can testify. There are nowhere nearly as many fish as you may think there are. There are even fewer fish names than the average citizen-sailor can (a) pronounce, (b) spell, or (c) even recognize as belonging to a fish. The reasonable names like TROUT, BASS, SALMON, and SHARK were used up long before I appeared. It takes some stretching to hook other than most common fish names to submarines and have anyone know you are naming them after fish. Stan, that's where I figure the CHIVO came from - rather than name a fighting fish the USS GOATFISH, those who came up with names for submarines instead chose the Spanish name (as they had for other questionable designations), hence naming that gallant lady we sailed on the USS CHIVO. Make sense? Speedy.